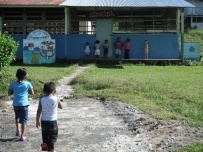 - Families build a school by incentivizing kids to get good grades, read books, complete all their homework, activities. Creates family time and kids learn about giving back. Reach out to book clubs around the US and get them to hold a dinner or dessert party. Everyone that attends will donate what they think their meal or treat was worth. All donations going to PoP. Kids love to draw and color in elementary school. Create a coffee book with their works of art and stories to be sold at Barnes and Noble and Amazon. A portion of sales benefitting PoP. How hard would it be to go without pens or pencils in the classroom for a day? Challenge teachers and classrooms to go without writing utensils for a day. For every pound you lose, the partner will donate $__ for a child to go to school and have enough food for a week. You’re losing weight and become your best self as the child in Guatemala gains food and education. Nationwide similar to the Aids Walk, pick top metropolitan areas. That's all I have so far...Thanks!